Rock and roll by its very nature is a primitive beast. It’s music from the heart, the groin and from the gut. Over the years it has mutated into a multi faceted beast that sees bands such as Rush and Muse employing all the levels of technology at their disposal to create something that is adventurous, bold, grandiose and beyond the financial and technical reaches of most mere mortals. At the other end of the scale, where the real exciting rock and roll dwells, you get bands like The Heavy Company (THC…get it?). THC strip things back to the bare bones; this is organic, trippy, bluesy, soulful hard rock and roll with no pretences…other than for making a fine soundtrack to an afternoon in the sun with a few beers, some herbal recreation and a pair of shades so you can check out the ladies without getting caught! 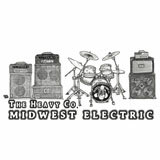 “Midwest Electric” runs the gamut from the foot down rock out of opener “The Humboldt County Waltz”, through the hazy shades of “A Groove A Mile Wide” to the Hammond infused drawl of “Neil Young”. It’s perhaps interesting that THC name a song after Mr. Young as I suspect this is the kind of sound he would favour if he were 40 years younger in today’s market. It’s also possible to draw lines of comparison to bands such as Monster Magnet at their spaciest, The Brought Low at their bluesiest to 90’s grunge funk heroes Big Chief at their greasiest. Sound wise THC keep things sweet, guitars make expert but not excessive use of delay and other such psychedelically bent effects but at their core remain natural allowing valves to burn and notes to ring out rather than burying everything under swathes of tiresome fuzz. The drums sound live and move things along though would benefit from a touch more volume and vocals are used sparingly but to great, laconic effect. Although multi tracking is obvious on here THC have achieved a very strong live-in-the-room kind of sound that’s both refreshing and intriguing. You really bet the feeling that this is how the band would sound set up in the corner of some dive bar with the lighting down low, the beer flowing and drunken girls sway as if hypnotised by the grooves. When people talk about stoner rock they seem to be talking about Big Muff driven sub Sabbath stuff like Fu Manchu or Kyuss but on “Midwest Electric” I would argue that, with their vintage, jamming style THC come far closer to capturing the essence of a truly stoned experience with their smoky grooves and spacey vibe. I’m sure Neil Young would agree. This is an album with the potential to become a slow burning classic…if you pardon the pun. Get comfy, turn the lights down low and enjoy the ride!! !